Slowly but surely, the Antlers’ building facade is being updated. 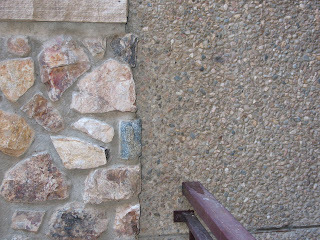 The original building, which was constructed n 1972, had a different type of stone treatment on the outside than the new Antlers which was completed in 2001. From many vantage points, the discrepancy was glaringly obvious. We are proud to say that it is now almost non existent. 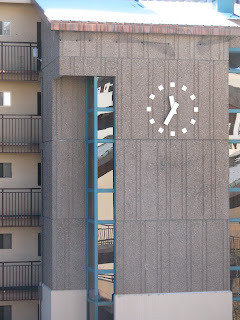 This is our clock tower as seen from the sixth floor hallway in our courtyard: It is the last major thing left to be covered in the beautiful new stone.Here is a section where the two come together: The new stuff is much nicer, don’t you think? Although the 07’ ski season is upon us here in Vail, I felt it necessary to inform you of our success in the summer softball league as the Antlers staff (and a few stranglers we found roaming aimlessly on the streets), dusted off our mitts, bought 2 bats, 4 softballs, and called ourselves the ANTLERS G.H.O.S.T. (God help our sh%@#ty team) We were an organized softball team again. Let me re-phrase that. They were organized and we showed up for each an every game with high hopes and aspirations of proudly displaying the athletic talent we were not quite sure we had. Our dreams were dashed of possessing the 1st place trophy and displaying it in the Antlers lobby, when after one inning, of one game, we found ourselves losing by 7 runs and wondering how to make an out. The anguish continued and I wonder if it has taken this long to write of it, because of it. Healing takes time. Some of the healing included the following: LeVine-thigh, hamstring, ankle…Ziccardi-two knees, right arm… Schlaeder-ankle… Walls-leg… Harl-both legs… Everyone else-bruises, contusions (most of these injuries sustained because we tried to catch the ball with various body parts rather than use our mitts). I was proud of our team though, and the enthusiasm we all displayed throughout the 8 game season could not be compromised. We finished with a perfect record in our division ( 0 and 8 ) and we were taught many lessons because of the experience this past summer. One of the most important lessons was realized after the first game. We knew that one case of beer was not enough to keep the team satisfied in the dug-out. Then we learned that Bagallis had the best pizza. Then we learned that the Sand Bar had the best wings. Then we learned that a team barbeque was in order to celebrate a complete disaster of a season. 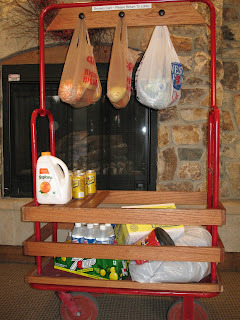 A few years back, Greg in maintenance took one of our older luggage carts and converted it to a grocery cart for guests to use. It was such a big hit that we were constantly looking for the thing all over the property. We just decided that it was probably a good idea to make another one. And then there were two….More to come? When Deanne Barker’s* offer to purchase a two-bedroom condominium in Vail was accepted, she was ecstatic. The professional mother of two looked forward to spending long weekends during the ski season with her family and friends. So she was heartbroken when – almost three weeks after she’d made the offer – her broker told her another owner had exercised the Right of First Refusal clause in the condominium association bylaws, at Deanne’s price and terms. Deanne had no recourse; she was simply out of luck. 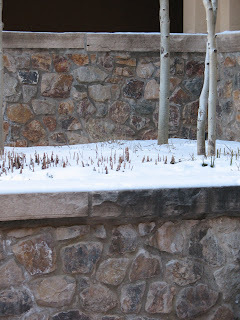 The Right of First Refusal process is fairly common in the governing documents of many condominium owners’ associations in Vail and other Colorado towns. With such a clause, whenever someone contracts to buy a condominium, they must wait a specified period of time before they can close the sale. During that time any current owner has the right to more or less “steal” the contract. If an existing owner chooses to exercise their right they must match the terms of the contract, but if they do, the buyer who had originally contracted for the unit is simply out of luck. Naturally, this can be a trying experience for someone who has gone through the psychological (and sometimes emotional) gymnastics necessary to make a million dollar buying decision. While the ROFR clause can be advantageous to existing condominium owners, the ownership of the Antlers at Vail will soon decide whether to strike the 20-day ROFR clause from its governing documents. After considering the matter for many months including a lengthy discussion at the last annual owners meeting, the Antlers Board of Directors unanimously recommended to the ownership that this clause be eliminated from the Condominium Declaration. Doing so requires the approval of 67% of the entire Antlers ownership (63 out of 94 total units). The board and management are optimistic that benchmark can be reached. The formal vote to amend the Declaration will be held at a special meeting on July 16. The Antlers Board has distributed a summary of their opinion, which makes the case that the ROFR could be a deterrent to sales, thus depressing property values, however slightly. Additionally, its implementation could be the source of lawsuits for a variety of reasons, as it has been elsewhere. The Board felt that whatever perceived benefit might be attributed to the ROFR, it was far outweighed by these negatives. Hopefully the Antlers ownership agrees. 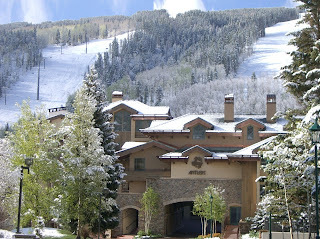 Since 1972, the Antlers at Vail hotel has offered a unique Vail lodging experience in a relaxed mountain setting. The hotel recently completed its $2 million swimming pool redevelopment project that includes two outdoor hot tubs and sparkling changing rooms in addition to the spacious heated pool that faces Vail Mountain. A mere 150 yards from the gondola, dining and night life, the lodge emphasizes exceptional service and amenities—including a recently renovated lobby, conference center, business center and fitness room, plus dog-friendly services and more. For additional information call 800-843-8245.